We've come a long way technologically, but we've never really achieved that whole "paperless office of the future", have we? Nowhere is this more painfully obvious than when you have to print out a PDF form, fill it out by hand, and then fax or mail it to someone. There must be a better way! That's why we have FillAnyPdf.com. FillAnyPdf.com lets you fill out, sign, and send forms online, without any need for hardcopy printouts! 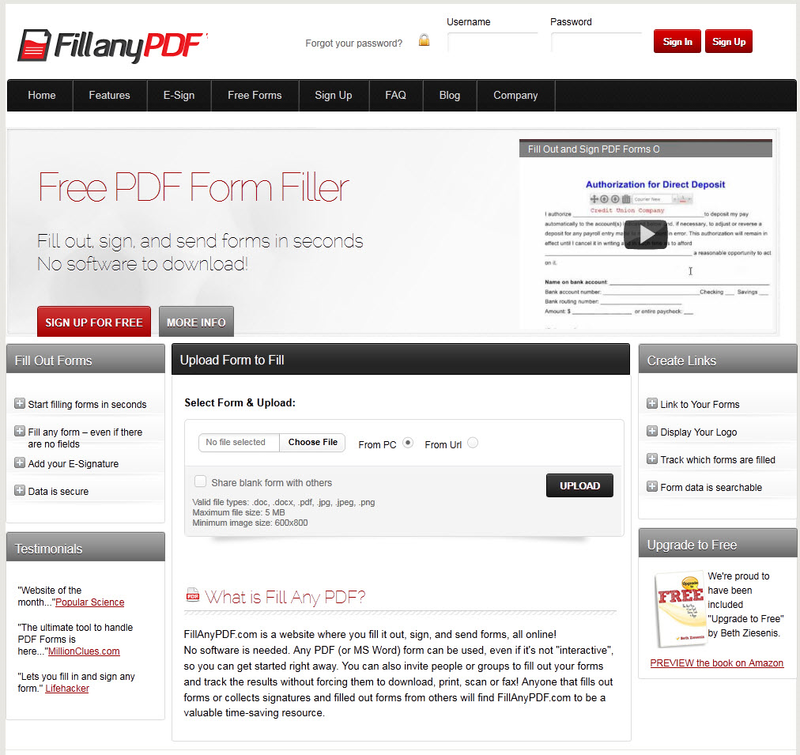 With FillAnyPdf.com, you can use any PDF form, even those that are not specifically formatted to be interactive. Best of all, you can invite multiple individuals or groups to complete your forms on FillAnyPdf.com, eliminating the hassle of printing and delivering improved feedback and response rates! And since you're living in an online world, FillAnyPdf.com lets you mess around with different font sizes and colors, ensuring that your form will look exactly as you like it. How does FillAnyPdf.com work? Well, the site uses special tracking functionality to allow you to sign PDF forms just by typing your name -- it validates your digital signature! And this tracking also extends to those individuals that you've invited to fill out a form, letting you see exactly who filled out which form at what time. If you're in the business of generating and distributing forms, you'll appreciate the ability to use White-Out and Redaction tools to customize old forms instead of reinventing the wheel. If you're worried about document security with FillAnyPdf.com, don't be! Your account and documents are password-protected and safeguarded by 256-bit SSL security, and the FillAnyPdf.com servers live in SAS 70 Type II facilities with full security and backup capabilities. Embrace the paperless office with FillAnyPdf.com! Keith Norton When I go to the product website, it is touting the free version of this software. There is no mention of the paid version. What does $95 get you that free doesn't? Constantin Florea @Keith. After you press the Buy Now button you will be directed to the Buy Now page where you can see the differences between the Free, 24 hours, Monthly and Annual versions.